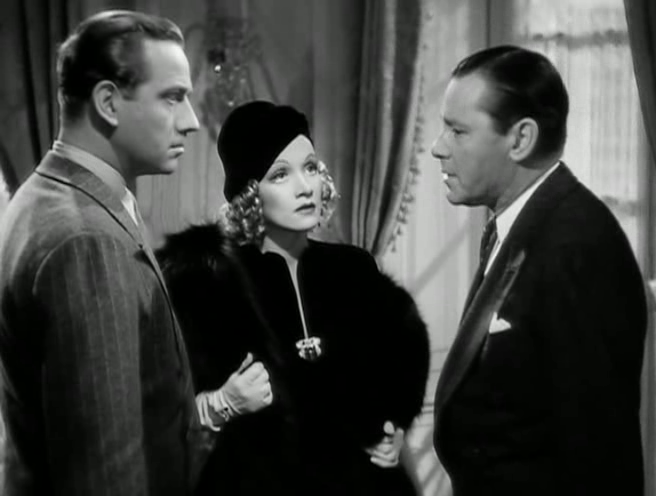 In his review Leonard says: "Disappointing film for Dietrich-Lubitsch team about Marlene leaving husband Marshall for vacation, falling in love with Douglas. Not worthy of star trio." The movie is listed as a comedy and may have been a disappointment to those who had first come to know Lubitsch from Shop Around the Corner, Trouble in Paradise, Ninotchka, or To Be or Not to Be. Angel was definitely more of a drama than a comedy. Most of his movies are set up as dramas, but then looks as the comedic side of the situation. That is the Lubitsch touch to me. Being able to look at a dramatic situation and then finding the comedy in it. Angel was a little bit more of a straight drama. It examined the same sophisticated materials that his comedies did, but he didn't seem to be poking fun of his characters here. He seemed to understand them. The movie portrays a woman Lady Maria Barker (Marlene Dietrich) who finds herself in love with her husband (Herbert Marshall) and the new man she meets, Anthony Halton (Melvyn Douglas). Her husband, Sir Frederick Barker, is an important man and is making decisions that may help with world peace but as a result he has little time for his wife. Halton plays a man who has nothing but time on his hand and is desperately in love with the woman he calls Angel. Angel must make a decision : to continue in a marriage which she is unhappy in or leave her husband and go off with Halton. The film doesn't present the situation in a comic manner (in spite of how IMDB might list it). Sir Frederick Baker understands that he must change his life to keep his wife and he decides that is what he is going to do. A really good movie, with three really good actors and three really good performances. Much better than the two stars Leonard gave it.